BETUMI: The African Culinary Network (www.betumi.com) connects anyone who delights in African cuisine, foodways, and food history. When I lived in Nungua along Ghana's coast in the 1970s I learned to love a fried sweet dough that the Ga people call togbei, which, delightfully, means "goat's balls." The Akan people call it bofrot (pronounced, more or less, "boff-row"). It is a flour dough (imported wheat flour) that traditionally uses palm wine (from the oil palm Elaeis guineensis) in place of yeast. The palm wine gives it a distinctive taste, but palm wine is not available to me here in Pennsylvania so I've substituted yeast and/or dry white wine.I've heard that (unpasteurized) beer also works, but haven't experimented with that yet. The oldest recipes I've seen call for using currants (and a more recent one calls for raisins), but I do not recall ever having tasted them made that way, and wonder if it is a Ghanaian regional variation or is more common in Nigeria, as bofrot appears to be the same dish as Nigerian "puff-puff." NOTE: If you are in Africa and are making these recipes, please be aware that I am using US measurements, so a "cup" equals 8 oz, not 10 oz as the "imperial" measures meant. Forgive me for not using metric here. 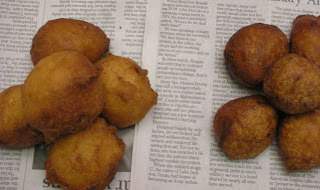 In contemporary Ghana, people also make a version of bofrot that is a larger cousin to North America's cake "donut holes," substituting baking powder for the yeast/palmwine. Such a version looks the same as togbei, but lacks elasticity. Bofrot is a popular street food. I remember buying them by the roadside freshly made and wrapped in newspaper. I like them as a snack with tea. Here is my recipe for the traditional chewy type (this can be doubled, tripled, quadrupled, etc. to make large batches). I suggest making the small recipe the first time. I experimented with a couple of versions. In one batch I substituted some dry white wine (sauvignon blanc) for the traditional palm oil, plus a little yeast; in another batch I just used additional water and yeast. Either way works. Measure out the liquid (either 1/2 cup warm, not hot, water or 1/3 cup water plus 3 tablespoons wine, warmed in a microwave if available) into a bowl, and stir in the sugar to dissolve, then sprinkle in the yeast to soften. Let it sit for a few minutes to allow the mixture to begin to bubble. While you are waiting, measure out the flour and have the nutmeg, baking powder, salt and yeast ready. Beat the egg and put it in a 1/4 cup measuring cup and take out 1/3 of that (I realize these are awkward measurements, but they work). Once the yeast begins to foam, add the egg and mix it with the liquids, then gradually sift and stir in in the flour. I just pour it through a strainer and shake it into the bowl as I'm stirring. Add the nutmeg, baking powder, and a pinch of salt. Mix all together well, and cover the bowl with a cloth and allow it to sit in a warm place for at least 2 hours. It should at least double in size by then, so make sure your bowl is large enough to accommodate the dough. When you're ready to fry the bofrot, heat your oil to 375 degrees in a deep fryer or large heavy pot. Line a colander with paper towels. 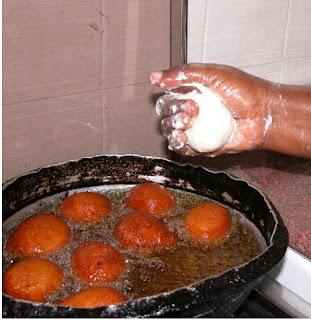 In Ghana, experienced chefs efficiently and quickly scoop up the batter in the hollow of their right hand and drop it into the oil in a perfect ball as in the picture at the top of this posting. For those of us who lack that skill, I usually use at least one soup spoon (first dipped in the oil to keep the dough from sticking to it) to scoop up the dough, then either slide it off the spoon with my fingers or another spoon. If the balls flatten out, there's likely too much liquid in your batter. If they sink to the bottom, your oil is not hot enough, and if they brown on the outside but do not cook on the inside, your oil is too hot. Make sure the balls cook evenly on all sides, turning them over as necessary. When they are quite dark, probably darker than you would think they need to be, remove them to drain in a paper-towel-lined colander. Enjoy them warm or at room temperature. 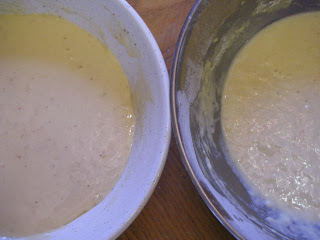 The pictures below are of both the cake (baking powder version, on the left) and the yeast version (on the right). Tomorrow I'll post the directions for making the cake type, using the recipe from Flair in Ghana. Just wanted to say that I've made the chewy bofrot variation before using "lemon curdled in evaporated milk" instead of palm wine as Alice Dede's book suggests. 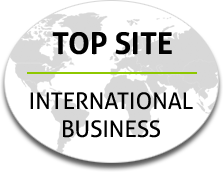 Very good results. 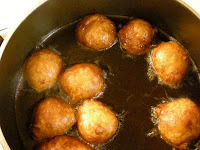 In Nigeria we have a similar recipe called Puff puff..yummy!